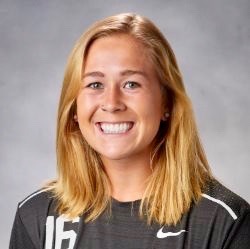 CHICAGO - Eclipse Select Soccer Club alumna and Valparaiso goalkeeper Drew Moulton (Sycamore, Ill.) was named the Missouri Valley Conference Defensive Player of the Week, an honor she has achieved for the second time this season. Moulton came up with seven saves and posted her third clean sheet during Valpo's 1-0 victory against Missouri State to open conference play on Saturday in Springfield, Mo. In other news, DePaul senior midfielder Alexa Ben (Schaumburg, Ill.) has been selected as a finalist for the 2017 Senior CLASS Award.